Here's a Doom WAD I made one day in 2013 and then abandoned for almost exactly 6 years. The other day I remembered it existed, dug it out of a dusty old backup of a long-dead laptop, and cleaned it up a bit. LUMBERJACK.WAD: You are in an open space filled with trees. Somewhere there is a chainsaw. You can use it to cut the trees down. TREEPUNCHER.WAD: Inspired by an earlier, buggy version of the same level, it's basically the same except you can also destroy trees by punching them. 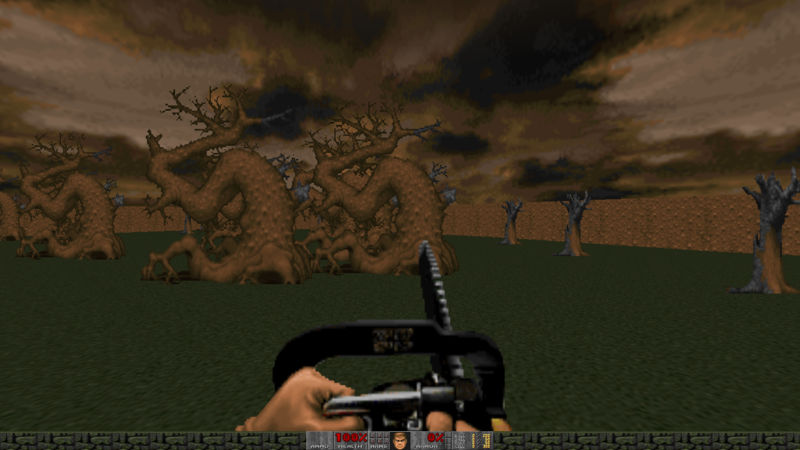 Requires a ZDoom-compatible source port (such as gzdoom) and DOOM2.WAD as a base. (I used zdoom to develop it originally, because it was 2013.) It'll also work with Freedoom Phase 2 but it just doesn't feel the same. I feel like it's appropriate to submit to The Great Resurrection Game Jam more than a year late? I love that this exists! Also, yes. Doom is not set up in a great way on my computer and I wanted to comment on this because of how much I loved the idea and concept without having played it. I will tell my doom loving friend about this and hopefully I can watch over his shoulder while he plays this.